… don’t be afraid by the bright green colour, it is all natural! Making a creamy soup without using any starchy vegetables like potatoes or the addition of cream is a healthy alternative. I have learnt from my mum and grandmothers that a vegetable soup needs to contain potatoes, and it took me years before I have been able to understand that potatoes doesn’t need to be one of the main ingredients in soups. Changing habits can take time! 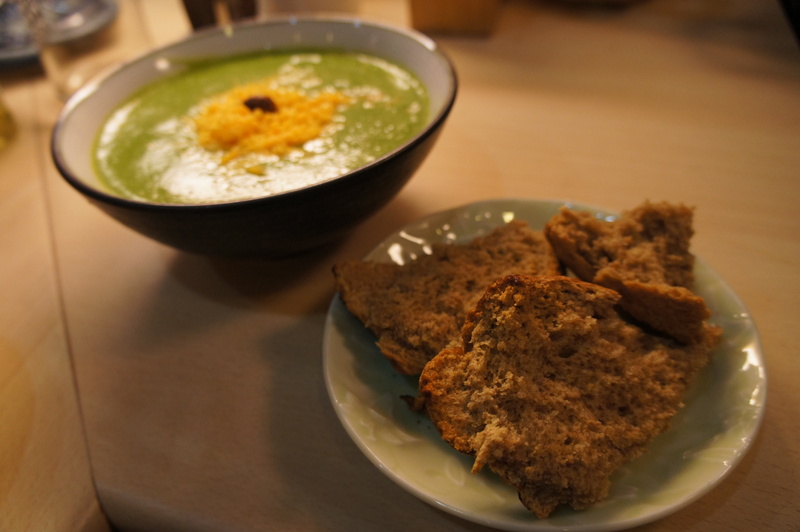 This soup is one of the most simple soups I am making regularly. It contains olive oil, onions, two green vegetables – broccoli and spinach, some old cheddar cheese (or French Comté or Gruyere), salt and peppercorn. This is it! 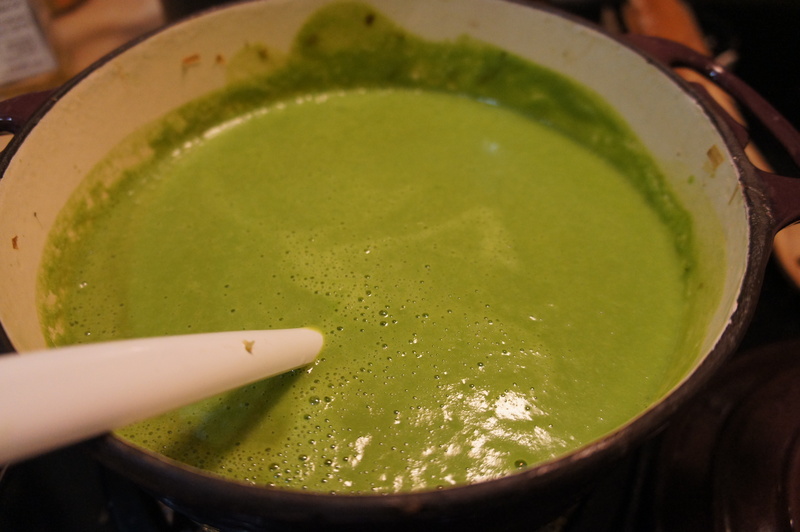 I love this soup, not only because of its bright green color that invites us to enjoy without delay the first spoon of this green nectar, but also because of its fresh and tasty flavors. 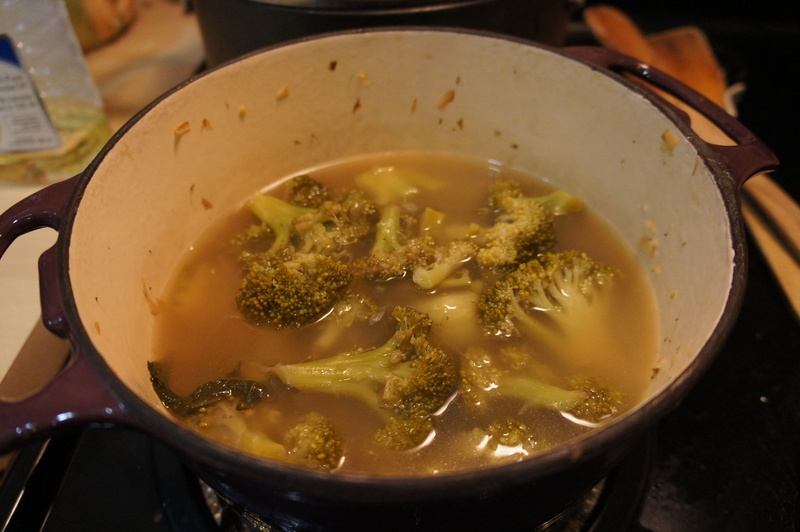 The secret, the broccolis are cooked slowly for more than one hour; this helps them to develop a sweet and nutty flavor and not the cabbage flavor that is so familiar when they are overcooked. 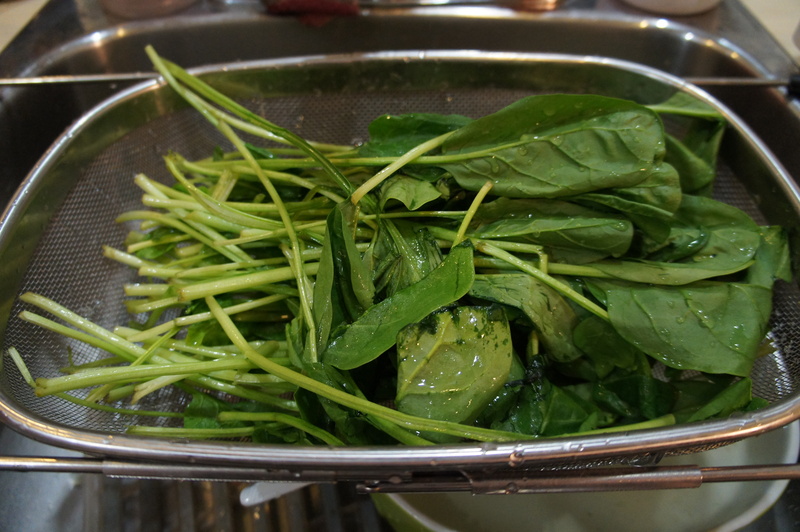 The spinach are added at the end, just before to puree all the ingredients together. You can enjoy this soup for dinner and keep the left over for your lunch. Adding green leafy vegetables to your diet is really important for your health – everybody knows this. But sometime putting this adage in practice is another story. Finding different ways to accommodate these green vegetables can be challenging. Meals where green vegetables are the main ingredient can be boring if your only solution is to cook steamed them. Stir fry, salad, smoothie, soup, pie… There are no limits. It is yummy! Every day, a new culinary adventure for you and your family! 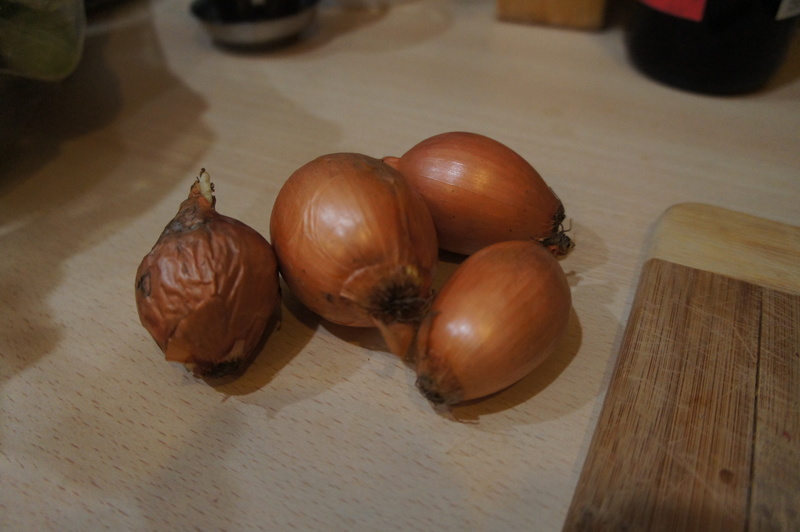 I think it is time to cook, this is my recipe (adapted from America Test Kitchen). Cut the broccoli florets from the stems. Peel the tough outer skin from the stems and trim off the fibrous ends. Cut the stems into small pieces. Heat the olive oil in a Dutch oven pot over medium-high heat until hot. 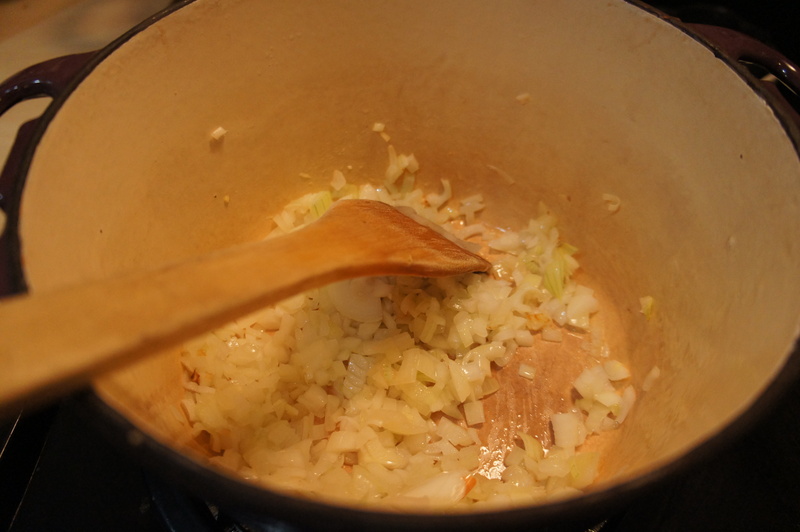 Add the onions and cook until light brown. 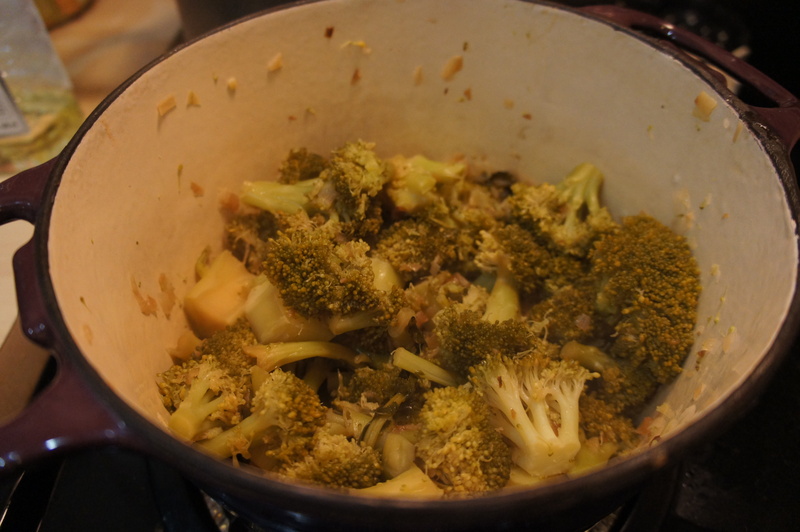 Add the broccoli, lower the heat to low, and cook for 1h. Add the stock, salt and pepper, and bring to a boil. Cook, uncovered, for about 1 to 2 minutes. Remove the soup from the heat and leave it to rest for 5 to 10 min. Puree the soup in a blender in small batches. Add some of the spinach and some of the Cheddar to each batch and then puree it. Return the soup to the pan and reheat over gentle heat. Taste and adjust the seasoning with salt and pepper. Thin the soup if necessary. Keep warm. It is time to enjoy… Bon Appetite! 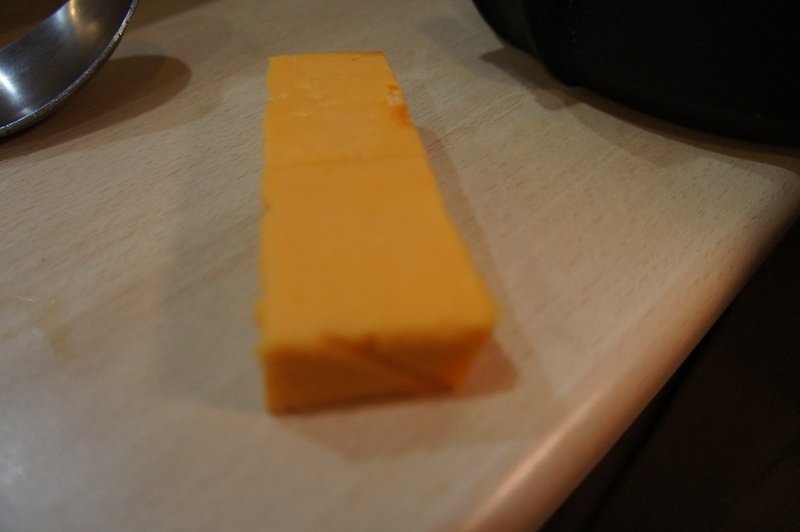 Served with graded cheese, roasted peanuts and bannock …. Yummy! 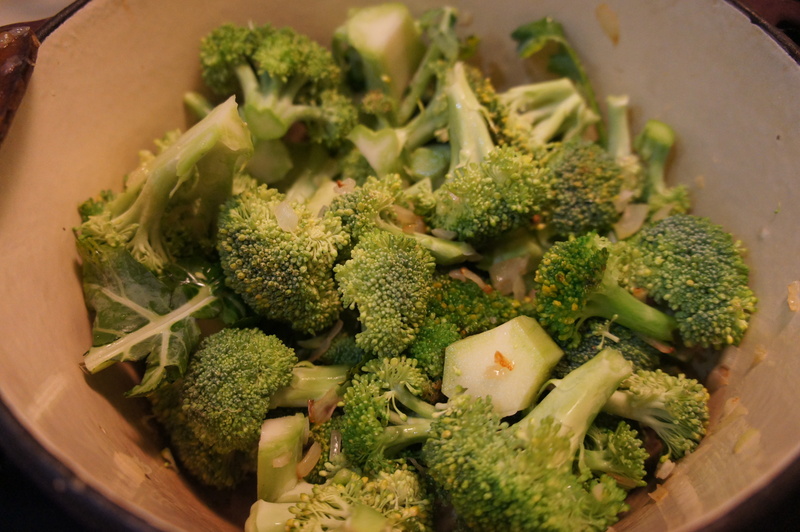 Boiling broccoli leads to the biggest losses of cancer-fighting nutrients. 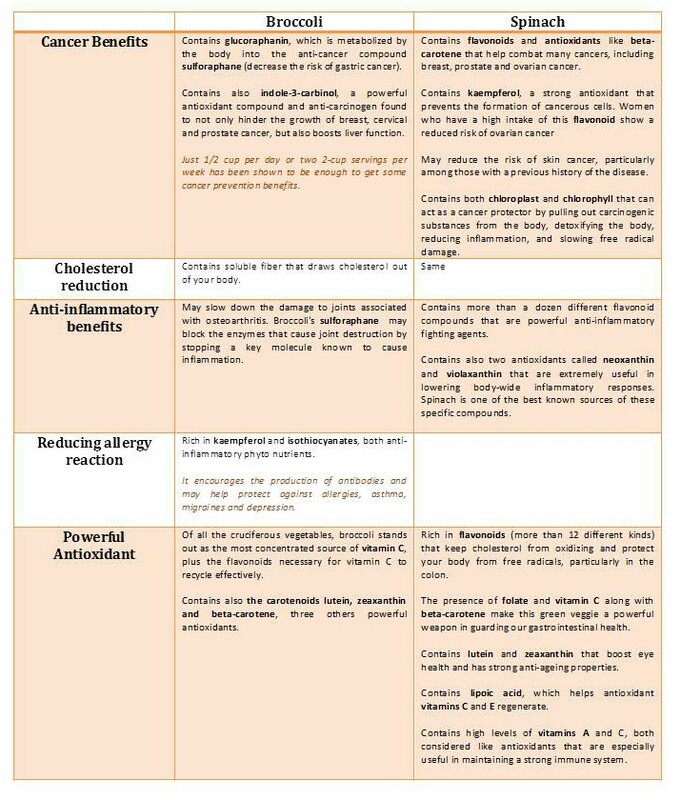 Steaming for up to 20 minutes, microwaving for up to three minutes and stir-frying for up to five minutes produced no significant loss of cancer-preventive substances. 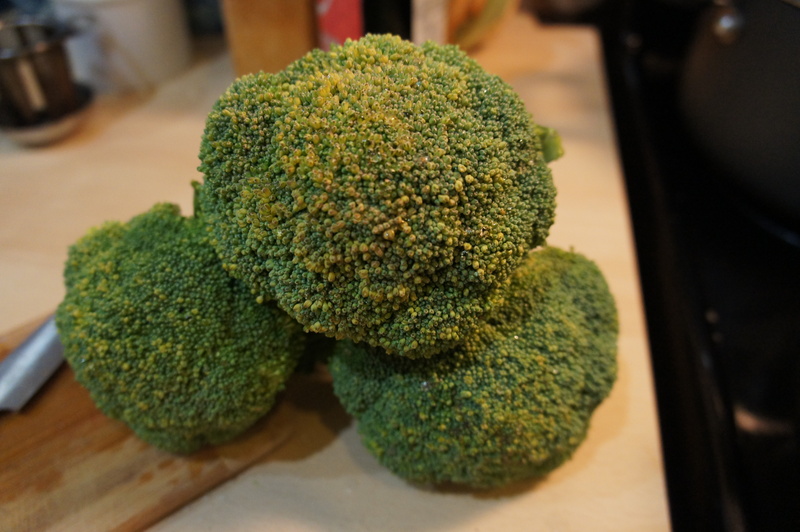 Raw broccoli maintains all of its nutrients, but it can irritate your bowels and cause gas. Cooking spinach actually increases its health benefits. Just half a cup of cooked spinach will give you twice as much nutrition as one cup of raw spinach. One of the main explanation is the fact that the body cannot completely break down the nutrients in raw spinach for its use. 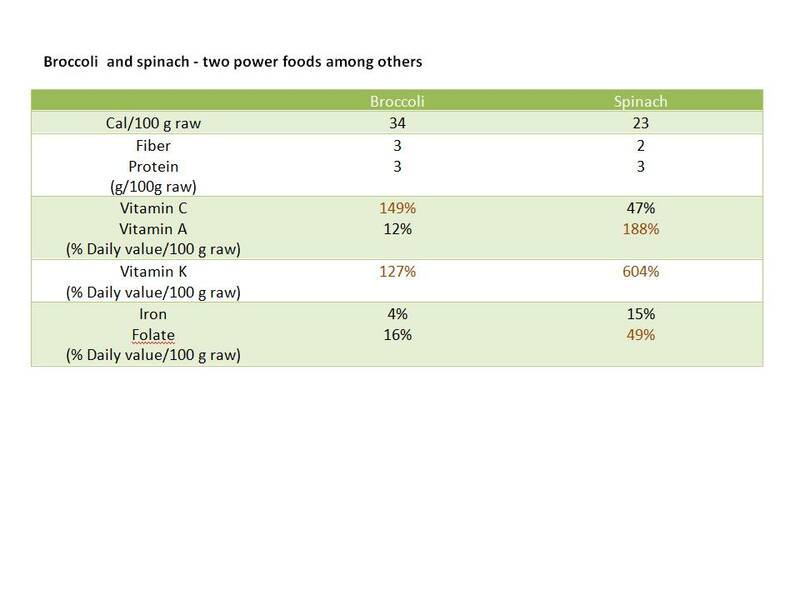 As an exception to the advice above (and this happens a lot in nutrition and health sciences), research studies have shown that taking spinach in juice form is actually the healthiest way to consume it. Blend spinach with other vegetables or fruits to create a delicious glass of juice, or try a green smoothie. Magnesium is a key nutrient that contributes to overall cellular health and plays an important role in more than 300 different bodily functions. 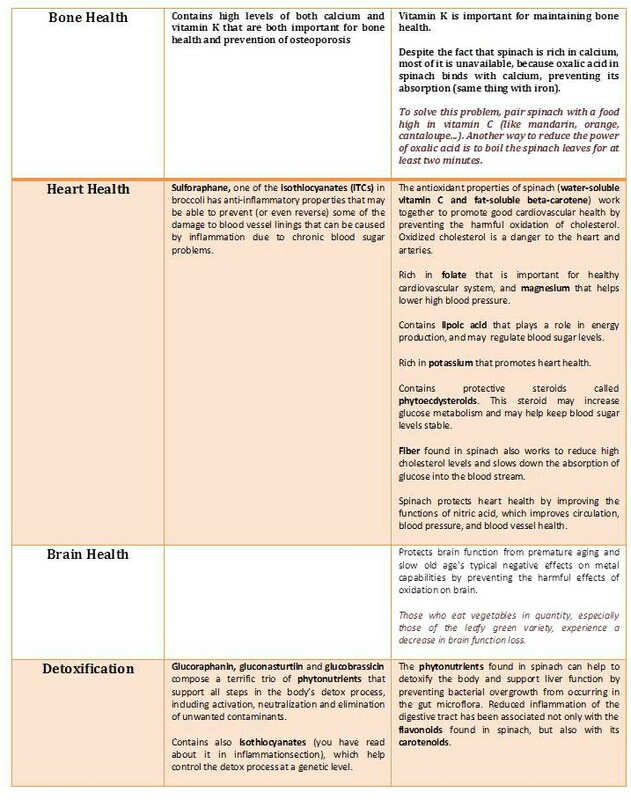 For example, magnesium is needed to regulate calcium, potassium and sodium, which together all control neuromuscular signals and muscle contractions. This is why a magnesium deficiency can sometimes result in muscle pains and cramps. Magnesium deficiency is also associated with insomnia, mood disturbances, headaches, high blood pressure, and an increased risk for diabetes. One major concern is the fact that a lot of adults in developed nations are actually experiencing a magnesium deficiency. The good news is, magnesium in spinach stays intact after being cooked. On the other hand, freezing spinach diminishes its health benefits. The way to get the best from the leaf is to buy it fresh and eat it the same day. Add spinach to your ‘organic shopping’ list, mostly because the leaf tends to be sprayed heavily with pesticides that don’t come off with normal washing. In contrast, if you are budget limited, you can buy and enjoy conventional and/or local broccoli without problems.